This is such a great combo and unique idea – my kids will love this. Happy to have found you and look forward to following – what great recipes and clean site! Thanks!! So glad you found CG as well. I think your kids might also like the seaweed eggroll wrap – and it’s easy for parents! You can also find us on Facebook as well! Pingback: Craving Avocado « Soaking in God's blessings, one journey at a time. i just made this for lunch and it was AWESOME. wow!! a perfect flavor combo. Thanks Rachel! It’s one of my favorite light lunch snacks and perfect for roadtrips too. Saw the photo above on Pinterest and made my own version with what I had on hand: cheese and avocado. Simple but still so yummy! I didn’t realize you had slit lengthwise so I just hollowed out by sticking a knife in the ends and then stuffed my filling inside, this worked well too. 🙂 Looking forward to trying this with turkey as you suggest! I’m going to link up to you on my blog and will be checking out more of your creations. would be great to cut into bite size pieces to serve as an appetizer at the next party!!!! so going to do that! Recipe sounds great. A alternative for the avocado could be a cheese spread (like e Laughing Cow or creme cheese) Will try a few variations. What do you do with the lushness of the interior you core out? Could you use an apple corer to clean out the center. 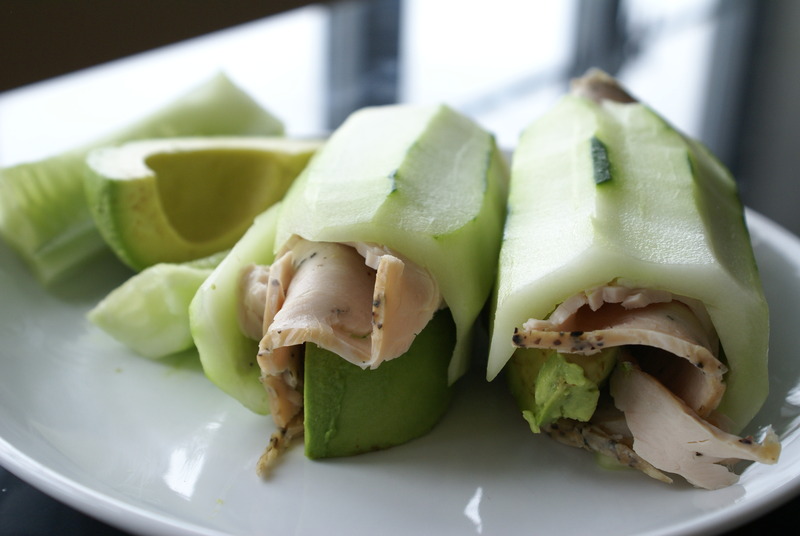 Could you use the cucumber center with some mint and Greek yogurt and make Taziki sauce to stuff in with the turkey and avacado? I actually put extra cucumber bits in my water and added some mint. It’s great for a refreshing drink since my husband only drinks water at home and needs some variety! I tried using an apple core device but found that it took too much of the cucumber ‘meat’ so I ended up doing it manually by hand with a knife. The tatziki idea is fantastic! Unfortunately, we have reduced the dairy intake in our house otherwise I’d be making that all of the time! YUM! what a great “go to” snack! I’ve also made with smoked salmon, capers, red onion & avocado – delish! Thanks Jessika! It’s one of the most simple recipes out there and I love the combination of textures and flavors. I’ll have to try your version too. Yum!